The Saskatchewan Public Works Association is excited to bring you our Fall Operator Workshop: 'Standard Operating Procedures, Contingency Plans & Emergency Planning Workshop' being held on October 2, 2015 at the Saskatoon Inn, Saskatoon, SK. Take advantage of a one stop day of education and networking opportunities! This 0.6 CEU workshop is being hosted by ATAP Infrastructure Management Ltd. It is designed to assist plant operators in developing their own standard operating procedures for routine maintenance and operation of water and wastewater treatment plant equipment. The importance of developing a preventative maintenance schedule and documentation for succession planning will be highlighted. The difference between Standard Operating Procedures, Contingency Plans and Emergency Planning will be explored and templates for basic plans will be provided. Contingency Planning for critical events such as electrical outages, process upsets and source water upsets are discussed in detail. Click HERE to see Event Pictures! The Saskatchewan Public Works Association (SPWA) is hosting our Equipment Expo & Golf Tournament on Friday, July 24, 2015 in Moose Jaw, SK. Our Equipment Expo is being held from 8:30AM - 11:30AM at the City of Moose Jaw Public Works Yards, after which, lunch is supplied. The SPWA Golf Tournament is hosted in the afternoon at the beautiful Hillcrest Golf Club starting at 1:00PM. Come and enjoy 18 holes of golf, a delicious supper, hole prizes, give-aways, and perhaps a few drinks with friends and suppliers. Invited to attend these events are the over 800 communities, RMs, and First Nations, along with government and municipal decision-makers, municipal engineers, consultants, suppliers, and contractors. This is a great opportunity to network with your peers and other industry professionals. The SPWA is offering you the opportunity to give our province’s public works professionals a hands-on chance to view your equipment, host an on-site practical session, and speak with them regarding your equipment or service. The Equipment Expo will be held at the City of Moose Jaw Public Works Yard from 8:30AM – 11:30AM, followed by lunch. The City has generously allowed us to use their City Yards, for a spacious area with access to their stockpiles for demonstration purposes. We invite you to consider attending this event and showcasing your equipment. The SPWA also has sponsorship opportunities for you, centred around the golf tournament. In addition to the sponsorships listed below, your business would be recognized on our Chapter website, special recognition will be given during the supper, your company’s web link will be posted to our Chapter web page for one year, plus recognition will be posted in the Western Canada Public Works Roadrunner magazine. This is a great advertising opportunity to promote your company to the public works professionals from across the province, and western Canada. •Hole in One Sponsor - $250.00 (2 available) - your signage is prominently displayed at your designated ‘Hole in One’. Your representative can present the prizes to any golfers achieving a Hole in One at your hole. To sponsor any of the above opportunities, display your equipment, or take part in the SPWA Golf Tournament, please remit the Registration Form in the downloads below, or contact the Chapter Administrator, Trina Miller. You asked, and we listened. Please find below the PDF versions on some of our educational, informative, presentations that the SPWA hosted during our 2016 Conference and PWville. Cross Connection Control Awareness (CEU'd) - Andrew Hickey - ATAP Infrastructure Management Ltd.
Demistifying WSER - Wastewater Regulations (CEU'd) - Gordon Will - Associated Environmental Consultants Inc.
Membrane Filtration Workshop (0.6 CEU) - Andrew Hickey - ATAP Infrastructure Management Ltd.
Click Here to view picture from the Conference! For more information, please follow the link: http://saskatchewan.cpwa.net/events/12878/ Read more.. Linking the people, with the information, skills, experience, and equipment at our Inaugural ‘Western Canada Snow Conference’, September 26 - 27, 2018. Read more.. 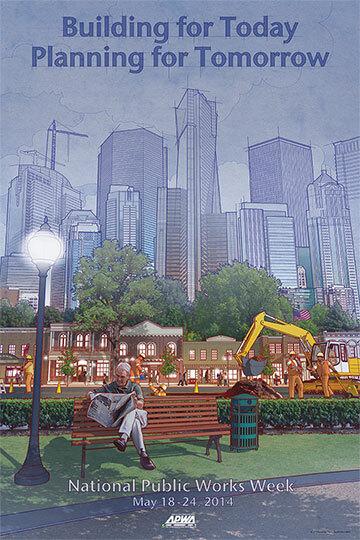 The Power of Public Works Read more.. This years theme is: "Community Begins Here". There would be no community without the quality of life public works provides. There would be no community to police and protect, no public to lead or represent. Public works allows the world as we know it to be. This year's theme "Community Begins Here" speaks to the essential nature of Public Works services in support of everyday quality of life.